In Colosseum you act as a Roman impresario - producing great spectacles in your arena in the hope of attracting the most spectators to your events. You'll earn wealth and glory for each event you run, using it to build ever more ambitious events. Attract the most spectators to one of your events and you'll be granted the title of Grand Impresario, with tales of your extraordinary spectacles acclaimed throughout the empire. 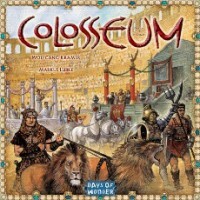 Colosseum merges a number of mechanics to give a solid game to keep a Euro-gamer interested throughout. Auctions, set collection, trading, roll-to-move (with a twist), variable starting positions, and upgrades with different powers come together into an enjoyable, colorful game. Your goal is to put on the grandest show in your colosseum. Your victory points at the end of the game are based on your best scoring show, not the sum of all of your shows. A savvy showman can jump from last to first easily in this game, and the front runner can be tracked down and passed at the end. A solid all-around game will help, but only if you can use it to beat out those building towards one giant show. Each of the 3-5 players starts with two (small) shows, which are different from the shows of the other players, and some performers/tokens to use towards shows. Each show needs a different combination of items to perform, with a number of points for putting on the full show, and fewer when missing components. The money you earn each round will depend on the points for the show performed. Investing allows you to either increase the size of your colosseum (needed for larger shows, and giving more room for dignitaries), buying new events (larger shows with more components for more points), buy season tickets giving more points per show, or an Emperor’s Loge, allowing you two die rolls instead of one for moving dignitaries. Once everyone has invested (one item per turn), you move to the auction. In the auction, you’re bidding on a set of three tokens. Each player may only buy one set (make it a good one!) Then players may trade tokens with each other. The main action is putting on your show. First, you roll to move dignitaries. The dignitaries walk around the board, based on the die roll. Each player has a colosseum set up along the way. If a dignitary stops in your colosseum, you’ll get bonus points. Then, you choose which of your shows to put on, and assign your tokens (performers), and gain points (including bonuses for previously completing shows). At the end of the round, you’ll discard one of the tokens used for your show, and the best show will gain a bonus. At the end of the game, the highest single round score wins. I find Colosseum to be a solid game, playing around 90 minutes. I place it in the tier of games above gateway games. While I have played it with new gamers, it seemed a little too complex in general. 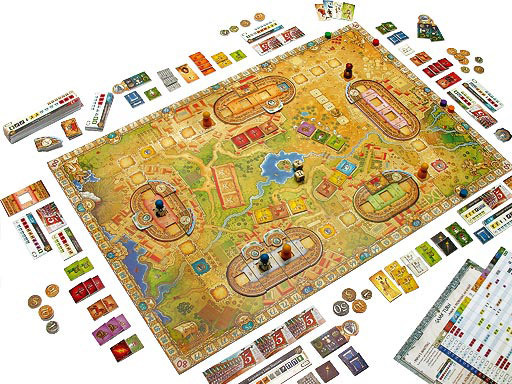 Learning the combination of mechanics will come easily to a Euro gaming veteran, but throwing all of them at someone new to boardgaming is a bit much. Colosseum certainly is not a major strategic brain-burner like Brass, Age of Steam, or even Power Grid and Agricola, instead being more of a moderate game. From my experience, it sits at a complexity that few gamers settle at, and acts more as a stepping stone from gateway to meatier games. If you’re looking for a visually appealing game to introduce to someone after they’re already hooked on gateway games, give Colosseum a try! In the world of Colosseum you are put in the world of ancient Rome tasked with the daunting job of running a show potentially for various senators, or perhaps even the emperor himself. Right out of the gate the game has an impressive layout. Each player starts with their own Coliseum some basic actors props and set pieces, and two shows that they can perform to amuse the masses. The pieces do an excellent job of keeping with the theme of the game. You then have 5 rounds to attempt to use your earnings from your previous shows to attempt to purchase even bigger and better shows, more actors, and set pieces, and try your best to impress all who attend. The game is played in several phases, allowing each player to feel involved and keeping the pace going throughout the game. First players are able to invest in their coliseum. They have the ability to gain an additional die to move the spectators around the board, add additional seats to obtain additional victory points, or even add additional sections to their coliseum so that you have more room for bigger shows. You also have the option to buy more shows at this stage. There is a list of 30 different shows, requiring different size coliseums and more actors/animals/props ect. After each player makes no more than 1 upgrade, (unless special tiles are played), each player can obtain asset tokens. This is done through an auction system. This means that if you have the money and you absolutely need those two priests to put on your next show, you can outbid your opponents and take it from them. Once each player has had a chance to acquire their group of 3 different tiles, they are given time to trade assets. There are no hard and fast rules here, so you can trade just about anything and this can become hectic. Still this can become a very fun part of the game. Now it is time to put on your show. Each player declares the show they are putting on, scoring more points for the more complete the show they can put on. For example if you are missing one tile for a show you will score one fewer point, and if you are missing 3 it could be 3 less. You also gain points for any nobles who attend your show, for any bonuses on your coliseum and for any previous shows you have put on. Afterwards a reward is given to the player who earned the most victory points in their current show, and the player who scored the lease can take one tile from the winner to use on their next show. All players then need to remove one tile from the show they performed. From top to bottom this is a game that I totally enjoy. With only 5 phases in 5 rounds the game has a set limit which does not make it a huge time investment (although it can run up to 90 mins), Some gamers dislike the mechanic where the player who is last gets to take from the player who is first, but there is still a great deal of thought and balance in this game. I have taught it to several friends, many who are experienced gamers, and some who are new and after a round or two they were in it without any difficulty, although with all of the phases I would not recommend this game for little ones. In the end this is a great game, and you will not regret getting or playing it! Days of Wonder has always been good at one thing: production value. And Colosseum just goes to prove that this is the case. The board itself, together with extraordinary senate pieces really makes this game a joy to look at. But does it have any good gameplay? You are putting on a show for the public of the Roman Empire, and your colosseum has to produce the greatest show of them all. The game consists of different phases, which will ble played out each round. You have to bid for new actors for your show, maybe trade some actors with other players, and then finally run your show. Preferably a new one, or else you won’t gain points. At first it can be a daunting task to figure out what you want to do. The game comes with a total of 30 shows that can be bought. But they all reqire different actors in order to run successfully. Fortunately, each players are given a handout with an overview of all the shows and what they require in terms of actors, but there’s a lot to take into account. It can be quite a handful at first, but after a few rounds, you should have chosen your path to success. The trading with other players is a time for negotiations. There aren’t many rules here, you just have to haggle with other players as best as you can. It’s a vital part of the game, so you had better have some enjoyment of this, or else it might be a bust. Some dice rolls defines who of the senates will move and how far. And you want them to oversee your shows, that brings a much larger audience. The good thing about the game is that it’s impossible to really know who will win. At the final stage, there may be a couple of surprises where other players have seen something you have not. It’s a nice game, but might be a bit overcomplicated at first. But once you’ve given it a go, the next game would be much better. • Superb production value—artwork and component are amazing. • Great phases. It feels like you have five games in one because of the varying mechanics employed for each phase. In one phase it is a bidding game, the next it is a trading game, the next it is a set-collection game, etc. This may sound like it is a Frankenstein design, but the sum is truly greater because of the parts. Despite being a fairly long game to play, the mini-games in the form of phases makes it feel like it takes less time. There is also a decent amount of interactivity between players, so it doesn’t feel like you’re just waiting for the next person’s turn to end. • A bit long. It plays like a gateway game, but takes as long as gamer games. • Box is glossy rather than matte. This may seem really nit-picking (ok, it is), but the box can be hard to open because of the glossy cover. • Need to have one player drive the other players through the phases. Maybe this doesn’t seem that big of a deal, but it can be hard to keep the game moving without someone saying, “OK, everyone. The next phase is…”. All in all, I really recommend this game. It seems there have been varying times when Days of Wonder has put this game on sale or bundled it with others. If you can get it at discount, consider yourself lucky. If not, I think it is worth the full price. i find myself playing this with my avid gamer friends, my psudo-gamer family, and my ‘what does this card mean?’ mother in law and having an equally fun time with each. i’ve yet to introduce colosseum to someone who didn’t go on to ask for a rematch. i realize that components dont make a game fun, but im a sucker for a good set. the quality of the board, tokens, and pieces is high, which is nice, but also very clever and self aware. the emperor piece with a little crown of laurels? too clever by half. some replayability issues could use some ironing out. 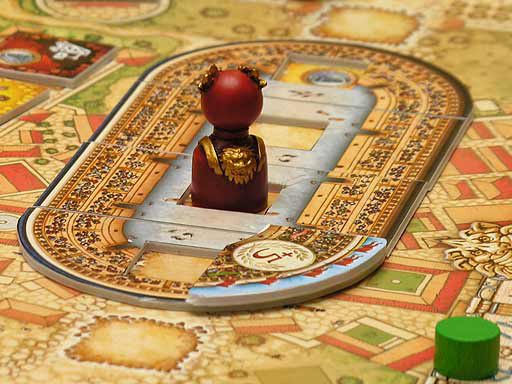 most notably, i notice that every player buys the emperors loge with their first turn every game, and thats just stupid. why even offer the upgrade if every player is going to take it? i recommend just assuming player playes by the loge rules right out of the gate and actually begin pursuing their own strategy rather than waste the entire first investment phase doing something monotonous and predictable. simple fix, DoW. still though, colosseum is an excellent offering and well worth picking up, some small issues aside. Add a Review for "Colosseum"